I will try to sit down and write new posts really soon, I really will, but lately I've been barely checking my Facebook from my phone, let alone had time to sit on the computer and edit photos or just surf a little and see what is going on with the world. I need more hours in a day for everything I set for myself to do. Two kiddos are amazing and I don't want to lose precious time with them now that it's nice outside and the new house has a ton of stuff we need to do on it. I think I need to slow down with the projects on the house, concentrate more on the blog again and enjoy the Summer. Until then, let me share another one of my favorites. 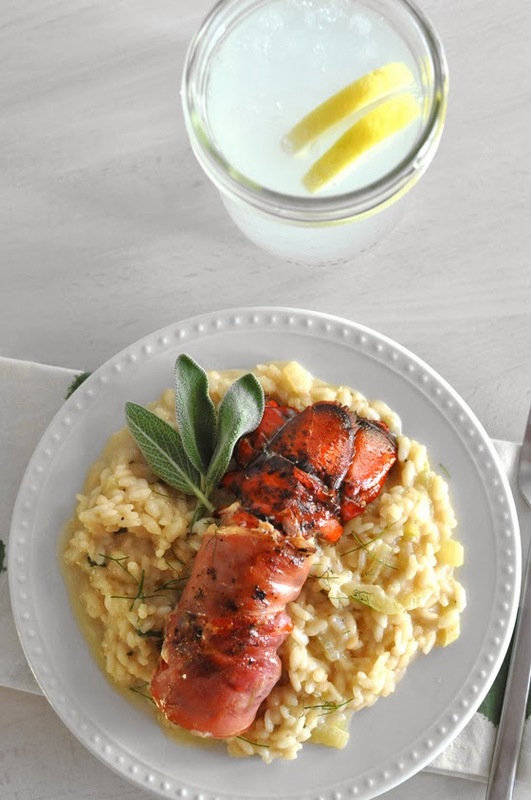 This dish is very Summery and the risotto is fresh and can be easily made with asparagus if you are not a fan of the fennel. Yesterday I made a version of it and instead of lobster we topped it with a grilled shrimp kebab, so very versatile, you should try it out! 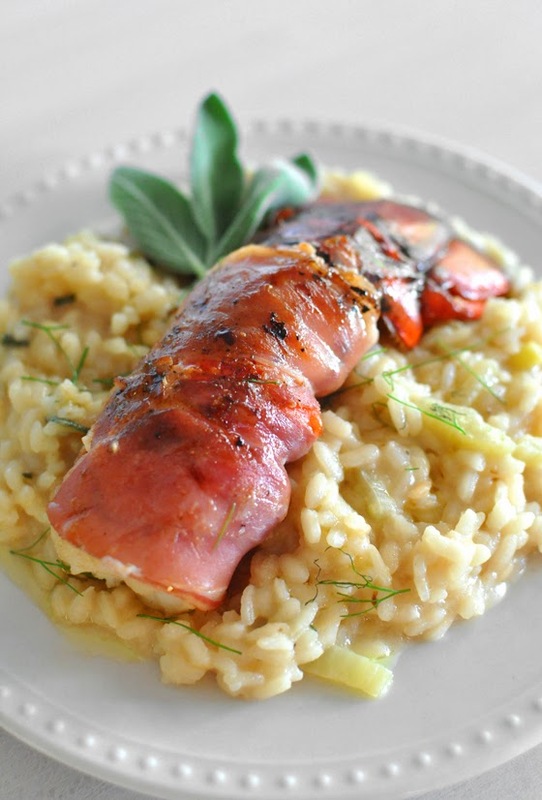 The prosciutto I used in this recipe is Prosciutto di San Daniele. I really like it, and while it is absolutely delicious to eat with yummy cheese and olives, it is also great to cook with, much better than what I am used to with prosciutto from Croatia, which is a bit drier than Prosciutto di San Daniele. Prosciutto makes me think of home, and I miss seafood. 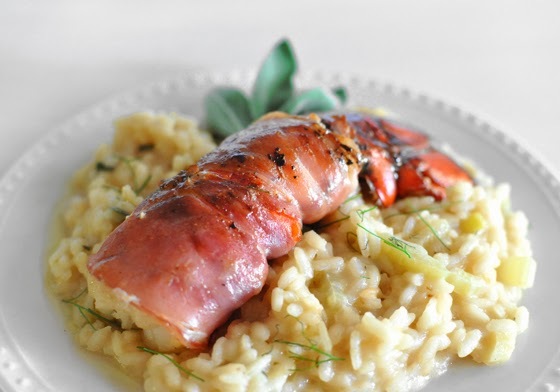 I happened to find some nice lobster tails at the deli where I bought Prosciutto di San Daniele and my mouth drooled at the idea of combining the two. Fennel came next in mind, and that is how the meal came together. I hope if you decide to make it, you enjoy it as much as we did! Put a skewer through the lobster tails lengthwise and blanch them for about a minute. Put a few drops of olive oil on the tail and then carefully wrap a slice of Prosciutto di San Daniele around each lobster tail and secure with a toothpick before grilling. I decided to use my grill pan for this, because it was cold outside and I didn't want to fire up my grill for such a small meal. Any pan will do just fine as well. Grill the tail for about 3 to 4 minutes on each side depending on the size of the tails you have. Put it on top of the risotto and finish seasoning it with some freshly ground pepper and a drizzle of good quality olive oil. Heat the olive oil in a big pan. In a separate pot heat up the stock while. Finely dice shallots and saute them until translucent. Clean and slice the fennel and add it to the pan. Saute until it starts getting slightly browned and then add the minced garlic and keep cooking for about 30 seconds. Add chopped parsley. Pour vine over the fennel and cook for a few minutes, until it reduces nicely. Love your rice and enjoy cooking it, as ridiculous as it sounds. If you are impatient or too busy to stand over it for 20 or so minutes, opt for a pasta dish. Risotto is not hard to make, how some people like to think, but it does require your attention or you will ruin it. It does not need to be stirred without stopping for 20 minutes, at least not in the beginning, but you can't let it go for five or even two minutes unsupervised either. Especially in the end when everything counts. After about 10 to 15 minutes, when the rice is more than half way done, mix in the Mascarpone and Parmesan cheese. It will take this risotto on another level and make it beautifully creamy. Continue mixing and cooking until the rice is al dente and then remove from the heat. Risotto should still be runnier than you want it at this point. Divide the butter in a few smaller pieces, gently mix it in the risotto and forget about it for two minutes. 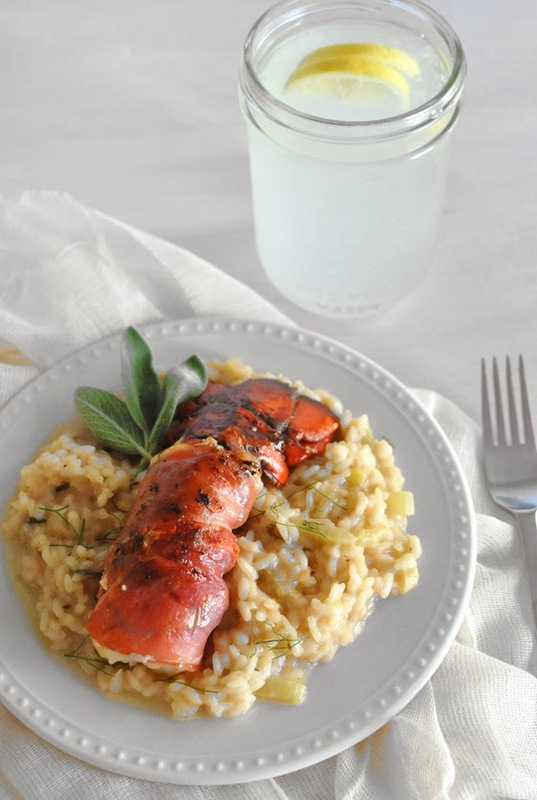 Plate the risotto and put your beautiful Prosciutto wrapped lobster tail on top. If you are not a fan of lobster, this dish would be gorgeous with large prawn tails wrapped in prosciutto. In that case you would use one slice of Prosciutto di San Daniele sliced once lengthwise and then cut in half, to wrap 4 prawn tails. Since they are smaller there is no need to blanch them first, and you can skewer four tails on one skewer stick and grill like that, about two to three minutes per side.